Music Man Blog: Book Review: Paul Anka's Autobiography "My Way"
Book Review: Paul Anka's Autobiography "My Way"
I grew up with Paul Anka, and he has always remained one of my favorite performers. Paul has re-cycled himself more times than I can remember, each time emerging as a more clever and astute singer/composer and performer. I never knew much about his personal life except that he was from Canada and had four beautiful daughters. Even though he was an extremely popular singer, he always conducted himself as a gentleman, and he was able to avoid getting in the middle of any press scandals. No small accomplishment for someone who has been in the public view for over 50 years. When most of the singers who started out in the 50's and 60's became old, they stopped performing. Paul had the smarts to recognize major music changes during his career and made the necessary changes to become new again. 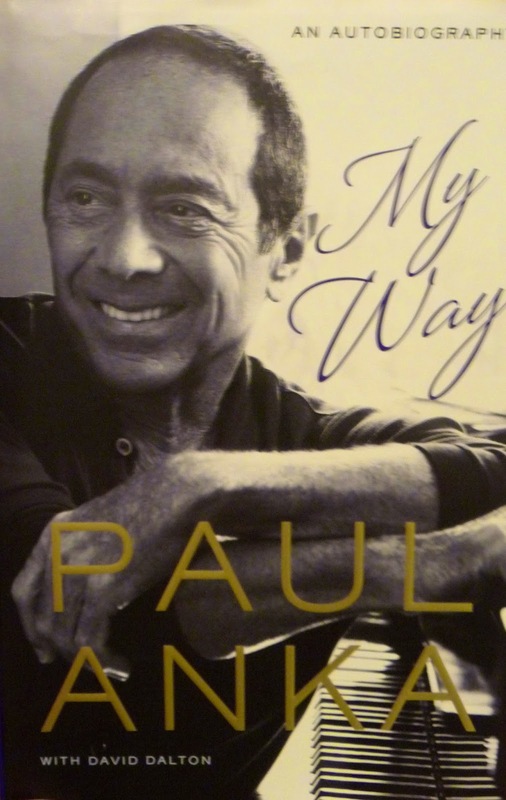 This autobiography is not just the story of Paul Anka's life and career. It is a story about the music and entertainment business of 6 decades starting in the late 50's and continuing right up to present day. Certainly for anyone who was around when Paul had his first hit, "Diana" this book covers life as you lived and observed it through these years. The focus on Vegas, Sinatra, the "Rat Pack" and the changes in the music business over the last 60 years are nothing short of fascinating! We all have our memories and perceptions of what Vegas was like in the 60's and 70's but Paul gives the reader an insider-look. I was very surprised that Paul's writing was so frank and detailed. If you are an Anka fan, you will flip out reading this book. Paul talks about all the rock and roll singers at the time he had his first hit and for me it was like opening a college yearbook and remembering my past. He pulls no punches and what he has written in his autobiography are the facts as Paul remembers them. I know a lot of my readers are Sinatra fans so I know you will love the following quotes from Anka. "I finished typing my final draft of "My Way" at five A.M. in the morning. I know Frank is at Caesars, I know he's offstage, drinking at the bar and I know he's there with Don Costa and I say, "Frank I've got something very interesting, I'm gonna bring it out. I flew to Las Vegas in August 1968 and I played it for Sinatra. I knew Frank loved the song when I originally played it for him but he always wanted to be cool, so all he said was "That's Kooky, kid. We going in." Coming from him, you have to understand that meant he was ecstatic." "Frank went into the studio on December 30. He knew the song so well he sang it in one take. All the musicians were there, this huge orchestra playing live. Everybody who'd worked with him through the years was there, they all stood up and gave him a standing ovation. I got a phone call from the studio on Sunset Boulevard and Sinatra played it to me over the phone and I started crying." Paul Anka's autobiography is just a wonderful read and a must read for anyone that lived through the same period of time Anka did! I have attached a "YouTube" of young Paul singing some of his early hits. The Music Man Awards This Book "4 Quarter Notes"